Many of you have asked us how things are going on our new site, well here is a brief resume of our first Summer at Pauls Lane. 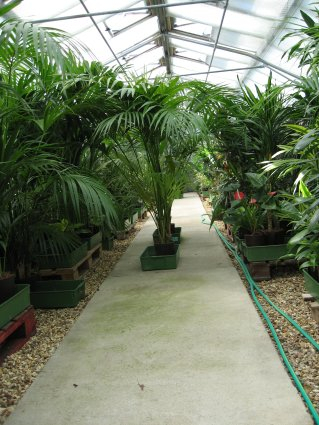 When we moved in the nursery had been used as a small retail site specialising in sub-tropical garden plants. Some of you may have seen pictures of the exotic planting on site. Unfortunately the glasshouses were in rather a poor state of repair, so our first priority was to get a good snug home for our own tropical plants. Being the “lean green” company that we are our initial task was to create raised beds for the hydro plants – simple using recycled materials to take the plant trays far enough off the ground to ensure air circulation. 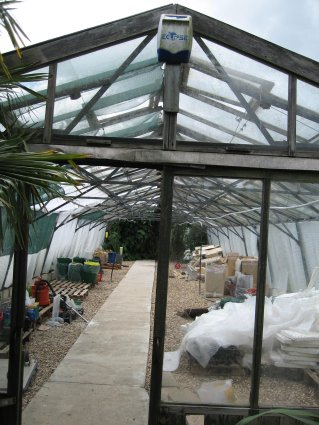 The next project was to heat the green house – not a cheap task... in order to ensure that what ever form of heating we ended up using would be efficiently used, the greenhouse was thoroughly insulated and shaded. In the meantime we had LPG gas installed, along with a very efficient blown air heater. By this time the weather was turning distinctly Autumnal and the plants settled in to a cosy season in their new home. Whilst all of these projects were being completed the new Envirolet composting toilet was delivered and installed – this is such a tremendous item that I think I will write a short newsletter giving links to the manufacturer – watch this space! Mark also took it upon himself to tidy the trees that had been planted by the previous owner and never pruned or trimmed. By the time the Winter came the overgrown conifers and hedges had been tidied and their trimmings turned into useful mulch for the site. This is just the start of our tenure of this site and we have many more plans up our sleeves for the future years.